All this unconscious machinery of death. as if we were not one of them. Brooks does not write gentle descriptions of the attractions of vegan life. His use of blunt language – occasionally with cold anger, sometimes hot with disgust – in the service of an idea stands outside the arena of mainstream public debate, an idea frequently treated as extreme, or even ridiculous. Brooks understands how entrenched our behaviours are and systems that he – critiques is too gentle a word – exposes and condemns. If there is a risk that this strategy will alienate the reader, it’s all the reader’s, not the poet’s – the reader loses out if she chooses not to tackle work that has, what will be for some, a profoundly confronting worldview at its heart. While I do not share Brooks’s views on this issue, I was excited by his treatment of poetry as an instrument in the world, a place where truly difficult, challenging ideas can be written in a way that avoids re-inscribing widely held values. Brooks is not preaching; he treats poetry as a place where meaning can be made, where the practices of consumption most of us unthinkingly accept can be challenged and might even be rethought. Like many Australian poets, David Brooks’s influences are international. In an interview with Poetry International, he discusses these influences in some detail. The foundation stones of Brooks’s poetic are not Ashbery and O’Hara, rather Galway Kinell, Ezra Pound, Czeslaw Milosz and the T’ang poets. It’s an assemblage that speaks to Brooks’s treatment of poetry as a style of ideas and confronted struggles. I might call it political, were not so grounded in personal life and personal ethics. It also reminds the reader that Brooks’s use of vernacular, and apparently loose forms, is also carefully worked to feel conversational, or like an interior monologue. To achieve conversation as coherent and attractive as these poems are takes considerable editing and experience. 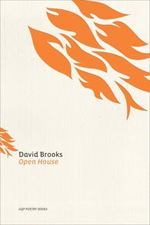 Brooks’s connections to poets he counts as influences are not only stylistic, but extend to his views on the purpose of writing poetry, both as a public and a personal practice. While at times Brooks appears to have a definite rhetorical intention, at others he treats poetry like an exhalation, a bodily, perhaps a spiritual, necessity. Some of the work in Open House struggles with grief and regret, human troubles, the thoughts that, in these poems, often appear in the small hours of the night. There are also love poems throughout the book, poems of quiet appreciation and respect as much as passion. Brooks retains his characteristic clarity and brevity of language, but uses these qualities in the service of describing scenes of pleasure and wonder. flowers in the short-cropped grass. The outrage is still present, where it’s needed, but the overall structure of the book allows us to arrive at a feeling of peace in the closing section that is intensified in the last few poems. Open House has something unusual for a book of poetry, a happy ending. This entry was posted in BOOK REVIEWS and tagged Ali Jane Smith, David Brooks. Bookmark the permalink.